Calcutta (now Kolkata) is the sweet-capital of the country. 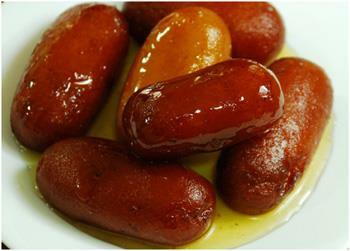 Many anecdotes are associated with different sweets of the city. In this article, the author discusses the association of Lady Charlotte Canning with a famous sweet of Calcutta. Read to know. Kolkata (earlier Calcutta) has been very famous for the variety of sweets. The variety of sweets available in Kolkata is simply mind-boggling. Such variety is not available even in other cities of West Bengal and Bangladesh. The sweet-makers (haluikars/mairas) of Kolkata compete with each other to develop different types of sweets. Bengalis take sweets in each and every occasion and even when there is no occasion. Bengalis settled in other parts of the world and in different places of India come to the city to take the sweets to their places. There are many anecdotes involving new sweets. One such anecdote is related to Bengali sweet ledikeni (a variation of 'gulab jamoon'/'pantooa' made from 'chhena' or split milk) which is associated with Lady Charlotte Canning, wife of the last Governor-General and first Viceroy, Lord Charles Canning. Let us know that interesting story. Lady Charlotte Canning was an interesting character. She was in India when the country witnessed the first war of independence during 1857-58. She was inquisitive, intelligent and in a way sympathetic to the Indians. She traveled various parts of the country. Considering the physical danger, it was a great fete. Instead of keeping herself confined in the Viceregal residence in Calcutta, she used to take part in heated discussions and debates with British bureaucrats and army officers. The then First Lady (Lady Canning) liked Calcutta (which was the capital of British empire at that time) and used to visit different areas of the city in palanquins and on horseback. It is stated that she was very fond of Bengali sweets. There are various stories how ledikeni first came into existence. Some connoisseurs say that the famous sweet-shop owner Bhim Chandra Nag (the famous shop along with its branches is still being run by the descendants of Bhim Chandra Nag), developed this sweet when Lady Canning first came to India in 1856.. Here you can have a look at the Top sweet shops of Kolkata. Some researchers opine that it was first served to her on her birthday. Some people say that when Lady Canning wished to have sweets at odd hours, Bhim Chandra Nag developed it from the left-over (unsold) sweets in the shop. Some other historians say that this sweet was developed by the haluikars of Baharampur (now the district headquarter of Murshidabad district of West Bengal) in 1857, after the first war of independence, to commemorate the visit by Lord Canning and Lady Canning. However, there is absolutely no doubt that ledikeni was the favorite sweet of Lady Canning. It is stated that no party organized by Lady Canning was considered complete if the sweet was not offered to the guests. The association of Lady Canning with this sweet has been documented in "A Glimpse of the Burning Plain: Leaves from the Indian Journals of Charlotte Canning" by British historian Charles Allen. Lady Charlotte Canning left the world in 1861. Her grave and memorial lie just beside St. John's Church in Calcutta, the favorite city of the Lady. Her favorite sweet, ledikeni became more and more popular after her death and it is believed that Bhim Chandra Nag and other sweet-sellers earned huge amount money by selling this particular item to all Calcuttans. Being born and brought up in Kolkata, I can totally relate to the article. It was amazing to know that the history of ledikeni comes from its association with Lady Canning. Bengali sweets are to die for and there is no doubt that this lady must have been crazy for Bengali sweets. A nice narrative, well written from a historical perspective. The big businessmen who are in the business of sweet making will always like to associate celebrities with their sweets if such an opportunity arises. Probably in this case similar thing might have happened.